We were at the prestigious “Showcase Ireland” at Dublin in January with a stand displaying many of the Fine Art Prints that we have available. This is Ireland's premier craft, gift, fashion and interiors fair. Business International Wales organised a stand for us and were extremely helpful before and during the exhibition, we cannot praise them enough for their help. 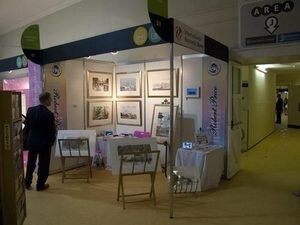 This was the first time we have exhibited at a show like this and to have an enterprise like this organise a group of about thirty exhibitors meant that we were and able to confide with others from Wales. 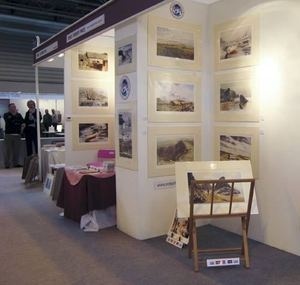 Then in just under two weeks later, we were exhibiting at the NEC Birmingham at their “Spring Fair“. This is a similar exhibition to “Showcase Ireland” except on a much larger scale. Just one hall alone was devoted to Artists, Print Publishers and associated trades. Both “Showcase Ireland” and the “NEC Spring Fair” are international exhibitions drawing in visitors from all around the world. All of this made the beginning of 2008 very hectic but well worth the effort.